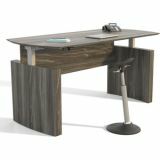 Safco Safco Medina Curved-End Height-Adjustable Desk Base - Curved Height-Adjustable Desk Base allows a more active workday with the stylish look of the Safco Medina Collection. Medina captures the spirit of Italian design that fills any space with style and height-adjustable capabilities to ensure maximum work-space customization. Top, control box and base are sold separately. When this base is combined with the control box and 72" or 63" Medina Curved Desktop, it creates a height-adjustable desk that serves a wide variety of users. The desk easily adjusts from 29-1/2" to 47-1/4" with the help of an electric control box (sold separately). 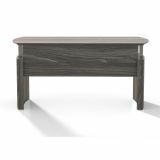 The 1" thick top features a distinctive beveled edge and silver detail to add a contemporary look. Part of the Safco Active Collection, the desk is designed to promote active movement throughout the day and engage major muscle groups to help combat the negative effects of inactivity in many workplaces. 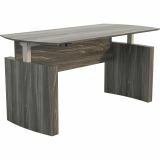 Desk can be paired with the Safco Medina Skinny Pedestal (sold separately).